On Thursday Hasbro and Sony released Transformers Roll Out, an album featuring transforming robot inspired tracks from ten very different artists, including Danish alt rock band Mew and Gavin Rossdale’s Bush. Let’s give it a listen! While it will never supplant the soundtrack to 1986's Transformers: The Movie as the official album of fandom’s collective heart, Hasbro’s new mix of mostly hard-hitting tracks has been growing on me since I purchased it via iTunes yesterday for $9.99. The album opens with the title track, “Roll Out,” from relatively unknown group Mount Holly, whose lead guitarist served as producer on the album. The band’s first album arrives this summer, so consider this a taste of things to come. The press release calls them alt-rock, which I suppose fits the track, though I’m getting some classic metal vibes here as well, which suits the subject matter quite well. You can watch the band perform an acoustic version of the song here. The second track on the album comes from British rockers Bush, specifically from the 2014 album Man on the Run. I was led to believe that all of the tracks on the album were original, yet Bush has been performing “This House is on Fire” for several years now. Next we have one of my favorite tracks on the album, “Gigantik” by The Crash Kings, an alt-rock band I’m not familiar with. I plan on rectifying that shortly, as this song is epic. What an amazing sound coming from just three people. Antonio Beliveau does strange and wonderful things on the clavinet. Pretty sure he’s riffing on the keyboards from Vince DiCola’s Transformers: The Movie work, and he’s nailing it. Mew! I’ve loved Mew for years, tearing my throat out trying to sing along with Jonas Bjerre’s high-pitched vocals. While some of the band’s newer stuff gets me a little lost, “Count to Ten” brings me right back to 2005's And the Glass Handed Kites. An original track created for the album, “Count To Ten” is a perfect marriage of softness and speed, power and melancholy. I am almost positive it’s a love story between Optimus Prime and Megatron. 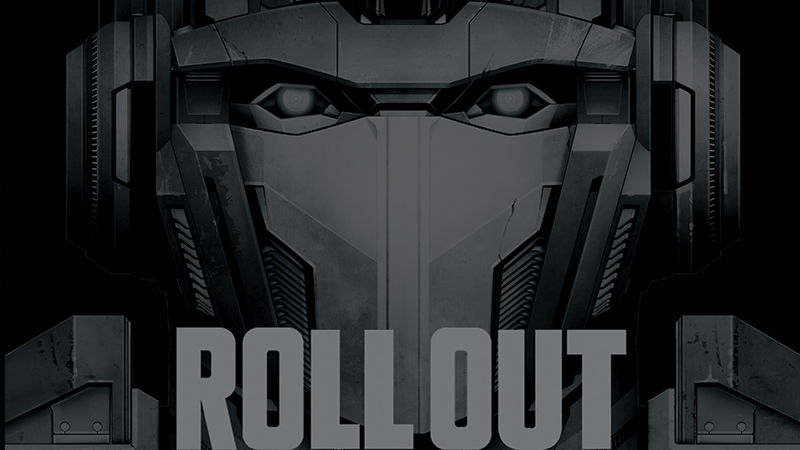 There are several reasons to love Transformers Roll Out’s fifth track, “Into The Fire” by Elle Rae. It’s got powerful female vocals. It drives hard. And I am pretty sure Elle Rae is Lisa Harriton, who co-wrote “Everything is Awesome” from The LEGO Movie. It’s pretty awesome. “We are the exiled ones / the lost daughters and sons of Cybertron.” I should not be getting teary over a stupid song about Transformers, yet here we are with song number six. Sadly there is no official YouTube embed for “Exiled” by the band Spurs, but there might be unofficial ones out there, or you can listen to snippet via Amazon or iTunes. Here’s an unofficial YouTube album rip, which I’ll link for songs six, seven and eight. If it goes away, it goes away. It’s slow and savory and just a little sad. Stupid eyes watering. Nice driving rhythm to this one, and he also incorporates “One shall stand, one shall fall,” into the song, making him maybe the second performer on the album to do that. It’s a good line! It flirts with fantasy metal at times, which feels right given that Transformers are both of those things. Lead singer Jimmy Gnecco has some amazing pipes on him. The next to last track in our musical tour of The Transformers comes by way of a more indie, folk pop sort of band called Darby. Modern Man smacks of vintage rock. I might taste a little bit of Bowie in there. The video here is from 2015 and suggests the song was being writter for a new Transformers video game. Perhaps they were confused over the nature of the project, or maybe their own tune tripped them out. I can dig it. Transformers Roll Out ends with a revolution. “Our Revolution” from the band Born Cages. At first I was confused as to what a revolution had to do with Transformers. Then I remembered years and years of IDW comics and went “oh yeah.” A nice tune, though I would have preferred the album end on a more powerful note. Something less angsty early Decepticon. Overall I am pleased with my purchase of Transformers Roll Out, the first full album I’ve bought from iTunes in years. It’s got a new song from one of my favorite bands, and not-so-new song from another, and several fresh faces that will be popping up in my music rotation for years to come. Knowing I share a love for Transformers with all of these acts helps. Til all are one and all that.